This card shows us how the energy of the 7 disks is recovered from. What was fearful and difficult now becomes approachable. There is a change of heart – whilst still some caution applies from the left over experience of the 7 disks. There is renewed confidence and ability to speak out – the yellow-orange of the background shows a background of confidence and solid self-assurance. The tree on the card shows good strong roots going deep into the earth. Though the new flowers are protected there is a really strong base of fertility that they are springing from. So this card talks about renewed confidence, and also the ability to take things step by step – moving forward yet not rushing anything. The foundation of the situation is strong and rooted in fertile soil. So in matters of business a project has good solid foundation for success and is reliable, a relationship is on good footings. However it is not the time to take risks nor to reveal all your plans and hopes. The card is an 8 so on the Kabbalah this is Hod – the position of mercury and of splendour – there is a dedication to the truth and to integrity in all things. So we see in this card despite a withholding there is also high integrity and what is held back is not done so out of manipulative methods – but more of self-protection and of the need to nurture further before allowing a new idea into the world to be assessed and judged in any way. This card is one of gaining strength, protection yourself and honouring your own need to have things feeling right before a risk or commitment is taken. Astrologically it is Sun in Virgo and so is about perfection and striving for the best in all things. It is also about service to something higher. 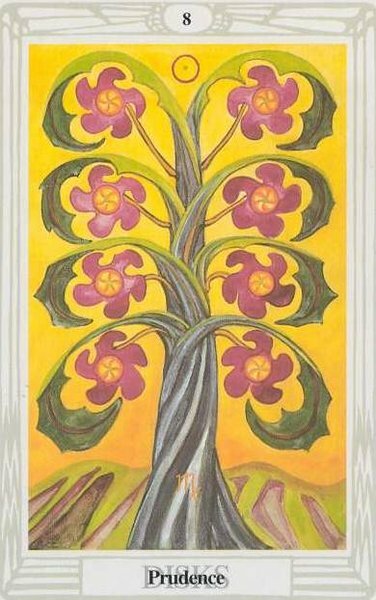 There is a link with geomacy with this card as there was in last months tip – the flowers are arranged as the geomantic figure populus. Populus is about people and community and how others around us show us ourselves. In this card I feel the link is connected to the service aspect of virgo and though we may not reveal our full selves to those around us at the moment – we have the strength and self-confidence to be able to put ourselves forward into the community to be of service to others. Perhaps giving a hand in a community project, helping someone or something get off the ground by simple yet effective offers of practical help.